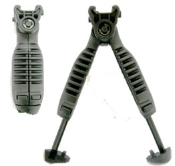 Transforms from foregrip to full function bipod with the push of a button. Independent adjustment of each leg in 5 different length settings. Legs are made form aluminum 6061-t6 hard coated anodized pictinny rails. unique double release button design eliminates accidental deployment of the bi pod. Non slip grip, ventilated design. Double side Pressure switch housing. Quick release mechanism or a secure bolt locking system. Performance-enhancing accessory for any firearm fitted with a standard (underside) picatinny rail. User installed-no modification or gunsmithing required.